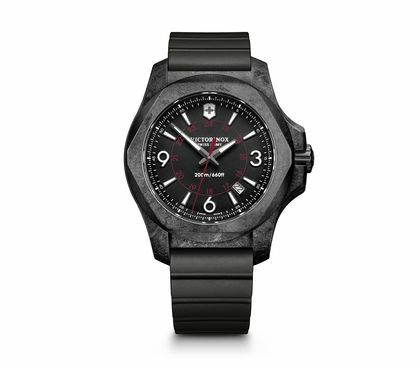 A watch that can endure 1000 °C never loses its cool. Highest resistance carbon composite - now in the new I.N.O.X. Carbon. Each I.N.O.X. timepiece passes through 130 strength tests but the new I.N.O.X. Carbon takes resistance to new levels. Made from a carbon composite that has protected space shuttles from reentry temperatures in excess of 1,260 °C, it’s the ideal companion for every adventure. Lightweight yet highly scratch resistant and with strong structural rigidity, the I.N.O.X. Carbon is built for durability in even the most extreme situations. Its dense, matt-black appearance with subtle marbling makes the I.N.O.X. Carbon ideal for individuals who want to make a strong style statement without compromising on functionality and Swiss craftsmanship. A genuine black rubber strap makes sure that the I.N.O.X. Carbon is suitable for all active situations. A Naimakka paracord attachment is available as an adventure-loving alternative.Traditionally used for parachute suspension lines, and with a breaking strength of 250 kg, the multi-strand nylon cord is permanently ready for 24/7 action.Its striking case gets extra shielding on everyday adventures from a translucent grey, removable bumper. From its monobloc dial with stamped markers and digits which ensure shock resistance to the red military time printed beneath the crystal, the I.N.O.X. Carbon confirms its quest for absolute precision. 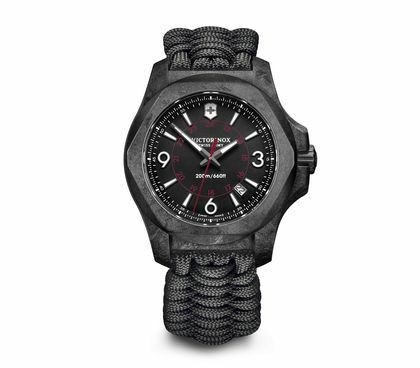 The industrial inspiration behind the watch’s design demonstrates the link between the proven Victorinox pioneering spirit and a high-tech present and future.